Custom manufactured radiopaque clad wire that improves the visibility of stents and wire under fluoroscopy as an effective alternative to marker bands is available from Anomet Products of Shrewsbury, Massachusetts. Anomet Radiopaque Clad Wire enhances the clarity and visibility of stents and wire under fluoroscopy and can be manufactured with different degrees of visibility by modifying the alloy composition and cladding thickness. Suitable for use with stents, guide wires, and related devices, this clad composite wire is less expensive than solid wire with marker bands and can be manufactured to precise OEM specifications and supplied on spools. 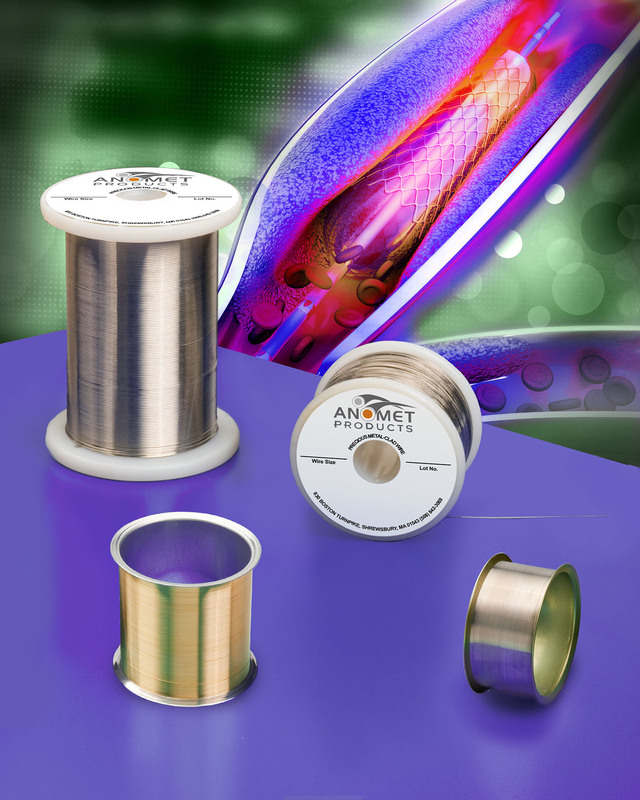 Available in sizes from from 0.05mm to 1.52mm O.D., Anomet Radiopaque Clad Wire can incorporate gold, platinum-iridium, tantalum, tantalum-tungsten, and similar alloys bonded to high strength wires such as 316LVM stainless steel, nitinol, and MP35N® with 2% or more cladding thickness. Two popular wire examples are Tantalum cored stainless steel and Gold clad nitinol. These premium medical-grade wires will not flake, blister, or delaminate. Anomet Radiopaque Clad Wire is priced according to composition and quantity. Samples and price quotations are available upon request.